Named after a zodiac sign of Chinese horoscope, Cross Year of the Rooster Fountain pen embodies sheer beauty and wishful luck. Add to that, Cross's iconic Townsend silhouette and you'll have a writing instrument that will even surpass expectation. The new Cross Year of the Rooster Fountainpen is a new addition to Cross's popular Chinese zodiac heritage of writing instruments. The pen portrays meticulous craftsmanship of Cross artisans and their urge to create finest writing implements. It's rich, glossy Titian red lacquer profile is decorated by a 23kt gold engraved rooster pattern providing it a timeless sheen. The glistening body of the pen is accompanied by a matching cap with Cross's iconic conical top. A brilliant red Swarovski crystal is mounted on the conical top, adding the missing spark of flair to the pen. Couple that with elegant gold plated appointments and it makes this fine writer an absolute beauty to behold. Appearance wise the pen looks gorgeous and features a sleek profile. The pen is sturdily built and has a medium weight. In hand, the pen offers a balanced feel and exhilarates the joy of writing. Most of the pen's weight comes from its cap, but as the cap posts at the low back of the pen, it provides a hassle free writing experience. Cross Year of theRooster Fountain Pen has a smooth resin grip section that tapers down towards the nib. Like other Townsend writing implements, this fascinating writer also features a snap cap. The cap opens/closes without any hassles and the sturdy clip ensures that the pen tucks perfectly in every pocket. However, the pen is very comfortable to hold and easy to write with, and will surely make a decent writing companion. Upon opening the cap, the pen displays a sturdy 18kt gold nib with an etched logo of the brand. The nib is smooth and lays down smooth and consistent lines without any hiccups. Available in medium, fine and broad, these nibs are an absolute delight to write with. 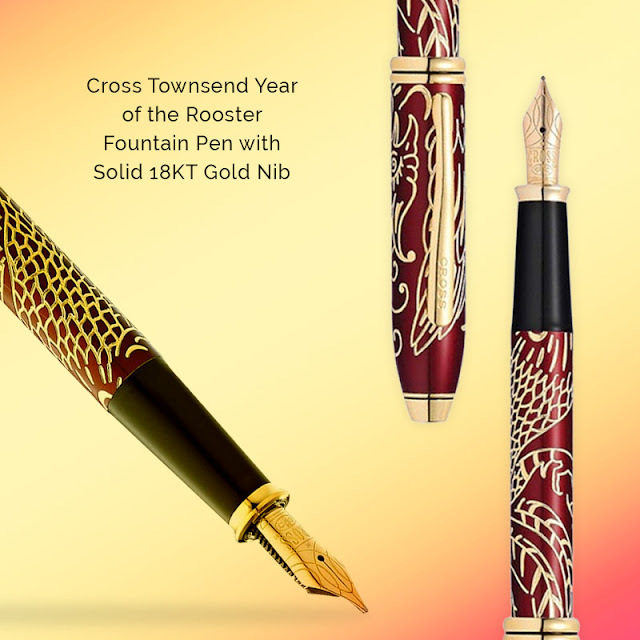 For people who are not into fountain pens, the Cross Year of the Rooster writing implements are also available in Rollerball and ballpoint version. Overall, the pen looks gorgeous and definitely lives up to the brand's name. This unique writer will make for a great collectible item and a prefect pen to carry around. Like other writing implements from Cross, this elegant writer also comes with a lifetime of mechanical warranty. This iconic writer is presented in a luxurious gift box with custom pen presentation stand, romance card, and decorated outer box sleeve - making it a perfect gift item.